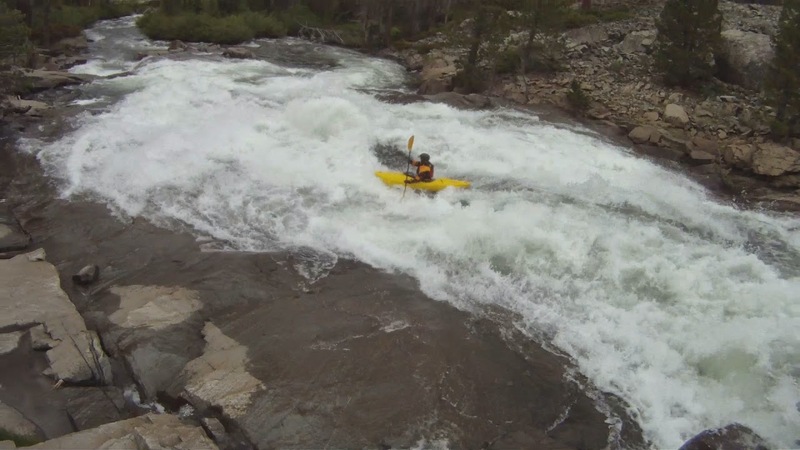 My last post talked about momentum and its role in whitewater kayaking, a common theme among coaches. Another way of looking at things has served me well, though it's harder to summarize and not something that I've heard from others. When paddling, you want to move on the water or across it, never against it. Every drop of water in the river is moving somewhere, including the water beneath your boat, and you want to follow it or flee from it. To know which, you have to look downstream, to watch the little bubbles and swirls in the water that tell you which piece leads where, and decide accordingly. This is what the great ones do when they scout, seeing every line, knowing where the water that flows cleanly through the carnage begins its route. Some even toss in a stick or leaves to help the reading. It's an art dictated by science, a skill worth time and practice. sharply to drop into the second hole. Seeing the water you want is the first step, but once you are are on it you are not done. To stay with it requires constant adjustment of boat and momentum, sometimes matching its speed but often moving a little faster and a little sooner to stay one step ahead. Move left before the water hits the rock and moves left; drive forward to accelerate just before the water falls off the lip of the drop. Find the safe route down by following the safe water. But more often than not, there is no single piece of water that will guide you safely through an entire rapid, or even a single move. Quite often, the water that is in the perfect place is not headed in the right direction. You need to pass over that water, moving across it in the direction of your goal. This requires moving across the water, for fighting against it will gain you nothing. The key lies in knowing when and how to disengage from the current.. This connects to the idea of momentum, where I said that in order to get right you have to start on the left. You start moving right by disengaging your boat from the current you are in. Change your momentum by turning your boat away from the flow, edge away if necessary, and paddling. This may take one stroke or many, a slight edge or a hard lean, all depending on how far you wish to move and the strength of the current you are in. Spot the new current you want to reach and continue to drive until you get there. Match its flow, its angle, and follow it for as long as it takes you in the right direction. Just like with momentum, the key is to start upstream. If you wait until you reach the point where you want to be disengaged, then it's too late by the time your boat is moving across the current. You need to get your boat unstuck from the current upstream in order to be able to make a quick movement across the current when needed. The stronger the current the earlier you need to escape it. The paddler is sliding across tongue to avoid the rooster tail. There's a few different ways in which this all goes down. 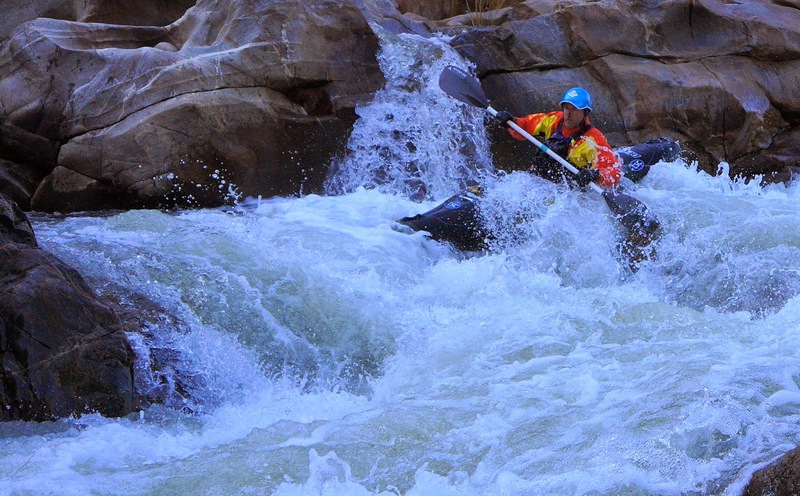 The simplest example of staying on the water is a tongue that leads you through the rapid. Start early and get on that tongue, matching it's movement, and ride it out. As you step up in the difficulty of rapids, it's less likely that a single tongue will get you all the way through. It might take you halfway through the rapid, or even more, but at some point you'll need to get off and find new water. In this case, you don't want to simple float on the water, you want to separated from that current. That means that your speed and/or direction should be different than the tongue - ideally moving across it in the direction you ultimately want to go, but it could also mean paddling faster, or even slower. Any difference will help raise your boat out of the water and make it more responsive to changes that you make. Another key place where the idea of separating from the water comes up is on boofs, or any significantly vertical drop. The reason we don't want to get stuck with the water is that it normally lands in a hole and recirculates. Once again, our goal is to separate ourselves from this and going across the water is often the best way. When approaching a lip, have a slight angle in the direction you want to go on your landing, or if that's not possible, accelerate to separate yourself from the current. This will make the actual boof easier and allow you to launch clear or the hole at the bottom. When the vertical drop gets higher, and boofing the waterfall a bad idea, we return to the concept of being on the water. Match it's speed and direction as you go over, plugging the drop and staying with the water that goes under the hole, popping up beyond the recirculation. Start by just noticing the difference in flat water between floating along and paddling across the water. Feel the difference when you try to move left - how much easier is it if you already where sliding in that direction, or if you were moving faster than the current, compared to when you floated on the water. Find your favorite boof and try it with different approach vectors. Launch from the same spot, but see if it's easier coming from one side or the other; see if you go further when you come in with speed instead of relying on the last boof stroke; see what happens if you plug it (caveat - make sure you know the landing is deep and safe before you try any plugging). When you're scouting a rapid, watch the water carefully and see where it goes. Start at the bottom and follow a bubble line upstream until it runs into trouble, then see what other line you'd want to be on at that point. Work the whole rapid backwards, and then follow it forwards, maybe even tossing in a leaf at different points to see where the water takes it. Plan your transitions from on the current, to across it, to back on again. It's a positive way of looking at the water on how to move on it, instead of watching the hazards and worrying about avoiding them. And whitewater kayaking should always be a positive experience. 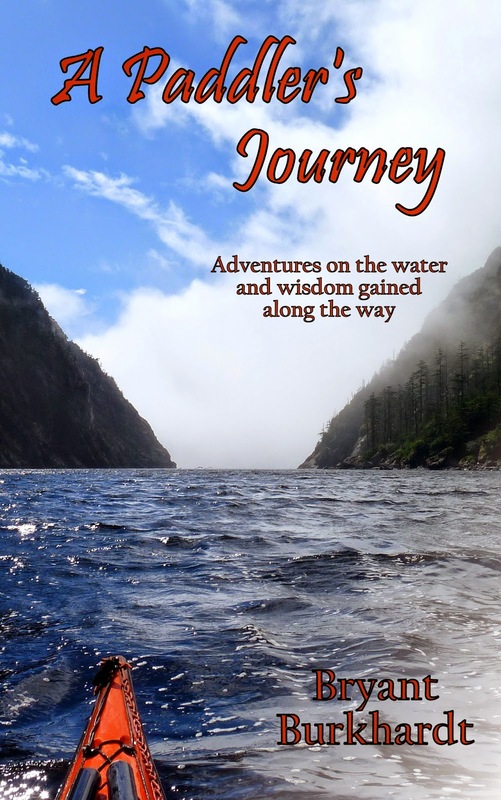 I finished off a rough draft of my kayaking memoir, A PADDLER'S JOURNEY, a few months ago now. Since then I've sent it out to a number of folks to read and review and I've gotten some very encouraging and helpful feedback. I'm still waiting to hear back from some people, but the consensus is that it's fun and accurate, though a few folks thought it could be a little more personal. I've been busy pitching my novel to agents, but now I'm ready to get back to the memoir. I've got some good ideas for revisions and hope to be able to complete them in the next month or two. For me it's a tough to balance the personal information with the kayaking information. I want stories that are fun to read, understandable to non-kayakers, and contain a little of the wisdom gained through the experience. It seems a little silly, but I don't want it to be all about me. My whole point is that my experiences may be unique in their particulars, but my experience in general is typical. 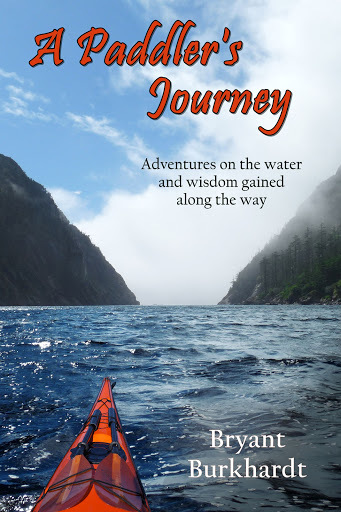 The book is about what all paddlers get out of the sport and I want people to see themselves in the adventures and relate to what I've gone through. I don't want to impress people with how cool I am and what great things I've accomplished. At the same time, people do like to learn about the author and be invested in their story. They like an insight into another person's world. Like I said, it's a tough balance. Once everyone was on the water and headed down river, I noticed two things that were different from my previous river paddles. First, this wasn’t a class. Gilbert gave me some guidance, knowing every rock in the river like the layout in his pantry, but I wasn’t expected to blindly follow him. Everyone else was busy having fun and zipping around. It wasn’t about learning anything particular or practicing skills; it was paddling for its own sake. People looked out for me but only in the way they looked out for each other, not the way an instructor hovers over a student. I could do what I want; if I screwed up, no big deal. Second, the scenery was beautiful. The run started in a quiet campground with a min-gorge of white granite walls, and while the road was nearby, it was always out of site. The river wound through a deep canyon, with riparian forest at the river’s edge giving way to brown, grassy hillsides above. This was kayaking in the wilderness, and once I felt comfortable enough to look up from the whitewater, I enjoyed every minute of it. I was hooked. Another thing that greatly eased my mind was the fact that I wasn’t the only person flipping over. Even the most skilled members of the group were playing around, sliding up rocks and trying to get their kayaks vertical. In the process they frequently failed and flipped over. It was a part of the sport, nothing to be ashamed of. I played around too and flipped over more. Sometimes we rolled just because it was so damn hot. In the first big rapid I collided with one of the other guys and we both flipped over and rolled up laughing. This was fun. At the end of the day I still sucked as a whitewater boater. It felt unnatural and I often leaned the wrong way or reacted too slow. It didn’t matter—I enjoyed it all. I lacked the skill to help in any significant way, but I hadn’t been a burden. I did what I could and had fun with the rest of them. That’s all they expected of me, that’s all anyone wants on an adventure. Maybe I did belong on the river. Too bad the season was over. I had one of those days the other day. Went for a surf session and got a couple nice waves but mostly fought my way in and out, got slammed by closeout sets, and kept chasing a moving takeoff spot all over the place. I shouldn't have been so surprised - the forecast called for a mix of swells, 4 ft. @ 9 sec. from the NW, and 3 ft. @17 sec. from the SSW. So what does all that mean? I'm sure many of you know, but for those who don't, interpreting a surf forecast is an essential skill for anyone who paddles on the ocean (in any type of craft). Let's start with the basics. Swell is the term for waves that travel long distances across the ocean. They are generated by winds somewhere far away from you, so don't worry about the weather report when trying to understand swell (that's a different topic). Here on the coast of California, our waves come from Hawaii, or Japan, or Alaska, and depend on weather that happened weeks ago. That's one reason we get big waves - they have a long distance to build up steam. The height of the waves is the number most people pay attention to, but what does a 4 ft. swell actually mean? That can depend on where you are in the world, but here in the U.S. the height reported is measured from crest (top) of a wave to the trough (bottom). For you scientists (and southern hemisphere folks), that's twice the amplitude. It means that if you're standing at the bottom of the valley in between two waves peaks, that's how tall the wave coming at you will be (it also means you can walk on water, so congratulations). That doesn't mean that the surf will be 4 ft., so keep reading. A couple caveats. Swells forecasts are predictions - they ain't always right. Even a swell report of what is happening right now isn't uniform - waves vary in size from one to the next, so many waves will be smaller and some will be larger. It's also important to note that on the open ocean, swell just goes up and down - it won't break until it gets to shallower water. So even a twenty foot swell is easy to handle in a kayak if you're in deep water - though getting there might be tricky. Swell turns into surf when it hits the beach. Don't stress about the math, but when the depth of the ocean is approximately 1.3 times the wave height, then the wave will start to break - which means the top will pitch forward and the wave will release it's energy. So a 6 ft. swell will start to break in eight feet of water, but a 3 ft. wave won't break until the depth is four and a half feet. That's why large waves break further out and small waves break closer in. How high that wave is when it breaks is not just dependent on the height of the wave, but also how long that wave is. (And the shape of the bottom, how steep it is, how uniform, and lots of other stuff affect the break, but once again that's a whole 'nother topic - good resource here). The length of the wave, so important to knowing how big the surf will be, is given by the period. That's the time it takes between one crest and the next - basically how long you have in between waves. A long period (over 15 seconds) means the waves are further apart; a short period (under 10 seconds) means they will be close together. It can be nice to have a long period because it gives you more time to get in or out between the waves, but that's not what's most important about period. Period also indirectly measures the energy of a wave. 20 ft. @ 20 sec. Think of it this way: how much stuff can you fit into a box that's 3 ft. tall? You can't actually answer that question unless you know how wide that box is. A longer period means a wider box, and it this case it means that the wave 'holds' more water. That's critical because when a wave breaks, that water is what rises up and crashes down on your head. And it's exponential (sort of). So a 4 ft. wave with a period of 20 sec. has four times the energy of a 4 ft. wave @ 10 sec. and the long period wave might jack up to 8 or 10 ft. in the surf zone, whereas the short period wave might only be 4 or 5. Hopefully you can see how important that is to know if you plan to ride that wave, or even are just trying to paddle through it. All this means that knowing the swell is 3 ft. doesn't really tell you much of anything about what the surf will be like where you're going. Some 3 ft. swells might produce nothing on the beach while others might create seven foot tubes perfect for riding or five foot dumping waves that close out. If you know the period you'll have a much better sense of the energy of the waves. If you know the direction, you'll understand how the waves will interact with your shoreline. There's definitely a lot more to the topic of surf waves, but hopefully these basics will help you get more out of your ocean experiences. Getting back to where we started - why was my day so rough? Two separates swells coming it at the same time, approximately the same size, created two different surf zones, one atop the other. Sometimes they canceled each other out. Sometimes they just crossed paths and confused each other (and me). Sometimes they added up, a four foot wave on top a three foot wave (with a long period) made for eight foot waves with a whole lot of energy that came out of nowhere. A couple fun rides when I was in the right place; many more good thrashings when I wasn't. It was my first time at that spot, but now I know it much better and will be eager to get back there when the southerly swell comes by itself. When people start paddling on the river they simply want to get where they're going without running into trouble. What separates skilled paddlers, those who move effortlessly around obstacles and paddle with grace, from whose who struggle to survive, is the realization that the battle is won long before the enemy is faced. The strategy to master is the role of momentum. Not to get too technical, but momentum is a vector, meaning it has a magnitude and a direction, both of which must be controlled to achieve the desired result. The beginner sees a rock and paddles away from it; the intermediate sees open water and steers for it; the zen master floats away from the one and towards the other with hardly a stroke. The basic concept to start with is this: if you want to get left, start right. Too many people see their downstream goal and try to get there early, not understanding that they will need to have momentum when they arrive and momentum is built upstream. Shooting for an eddy on the left, they start on the left side of the river. When the eddy approaches, they point their nose at it but the river carries them past. 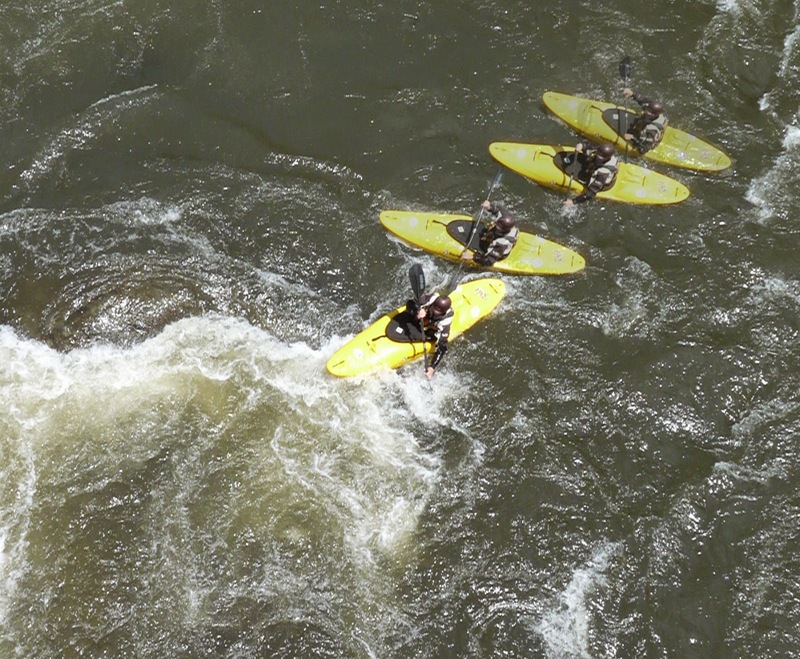 They scramble to paddle forward and eventually aim upstream, clawing their way into the bottom of the eddy. They were in the right position at the top of the eddy, but had no momentum to carry them in the direction they wanted to go. If you start right of the eddy (exact distance will depend on strength of the current and your own speed) and are already moving to the left as you approach the top, your momentum will carry you across the eddy line and into the eddy itself. The same is true of any target - if you want to avoid a rock, one of the best places to be is right above it with momentum heading away; if you want to hug the inside of a river bend, start on the outside and paddle towards where you want to go. It's not enough to know where you want to be, but you also have to know which way your momentum should be carrying you when you get there. to paddle hard to avoid the hole on his right. The next level is understanding how your boat interacts with the water to change momentum for you. We've all seen two boaters enter a rapid at the same place and achieve vastly different results. The expert takes a handful of strokes and emerges at the bottom unscathed; the learner battles fiercely to follow the line, blades windmilling and boat turning every which way, only to get pushed off course and fighting to survive. It's the difference between letting the river provide the power, using it's flow to redirect the kayak when needed, and trying to do everything through brute force. A wave will deflect you in the direction your nose is pointing. A wide stroke against that wave, on the downstream side, will accelerate the change in direction and move the boat across the river. Catching a blade in a passing eddy will slow the boat and allow the water to take the paddler on its path, whereas a driven boat will cross currents with little change in momentum. Sharply edging a boat away from the current increases its affect, while flattening the boat will minimize it. Use these tools to let the water move you from one side to the other, always with an eye far downstream, adjusting to the next goal well before it arrives. The best way to work on understanding and using momentum is to eddy catch your way down a rapid. Pick a long rapid, ideally a step below challenging for you, with lots of rocks on the sides and in the middle. Work your way from right to left and back again, catching as many eddies as you can along the way. Start by spotting the crucial point right before you catch the eddy - where do you need to be, which way should your boat point, and what momentum should you have when you get there. Once you can hit your target with your desired momentum, try repeating the performance with fewer strokes. The fewer strokes you take to accomplish your goal, the more you'll have to let the water do the work. 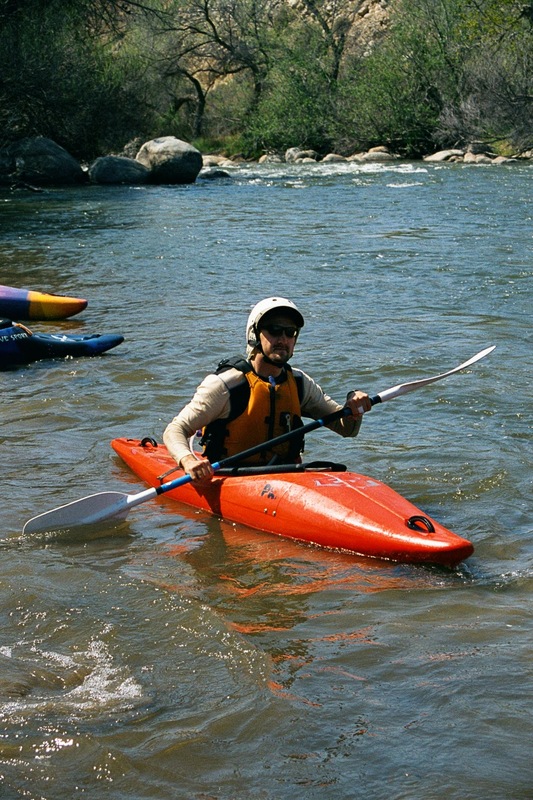 Play around with edging and boat angle, slow your strokes down and pay attention to the flow of water around the paddle. The same tricks that allow you to leisurely move around on easy rapids are the ones that will let you handle harder rapids when the slots are narrow and the water more powerful.